If you are an existing valid license holder of FooVideo then you are entitled to a free FooGallery PRO license. Click the Upgrade Now button. 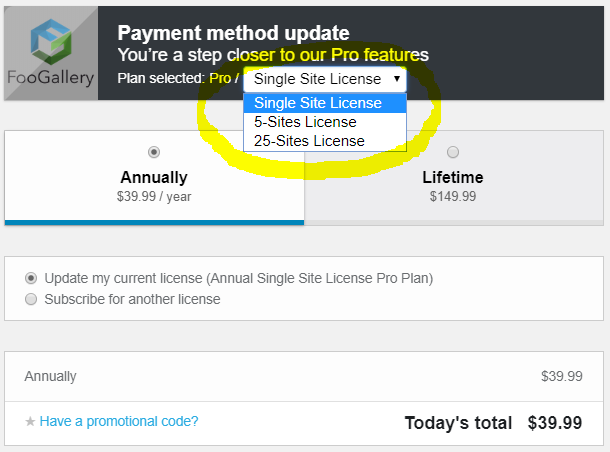 (the button could also say "Your Plan" if you have an existing FooGallery PRO license). On the next page, select the correct plan according to your FooVideo license. Enter your coupon code in the textbox that appears and click Apply. Click the Upgrade for Free button. Congrats! You should now be successfully upgraded to FooGallery PRO.